FOR SALE – FROM ARTLOVERSNEWYORK – “We CURATE – You COLLECT”. 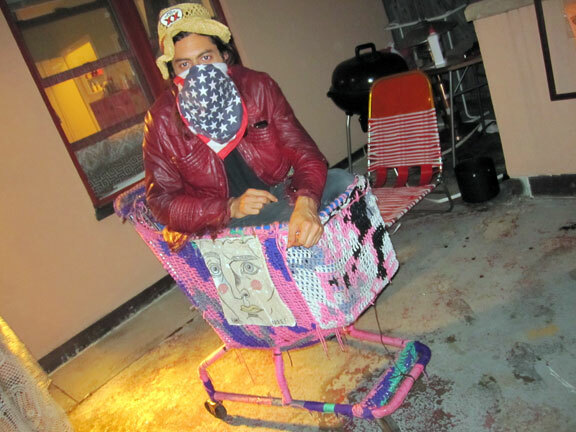 . .
this trademark OLEK camo crochet slam is done on her trademark metal grocery store shopping cart. It was re-claimed from the streets, this summer (2011), from a homeless hard-core hoarder, o.k. 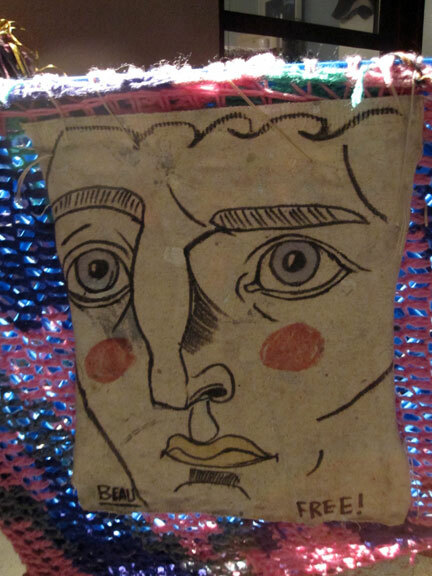 a bum – with an eye for art !! who calls Tompkins Square Park home. 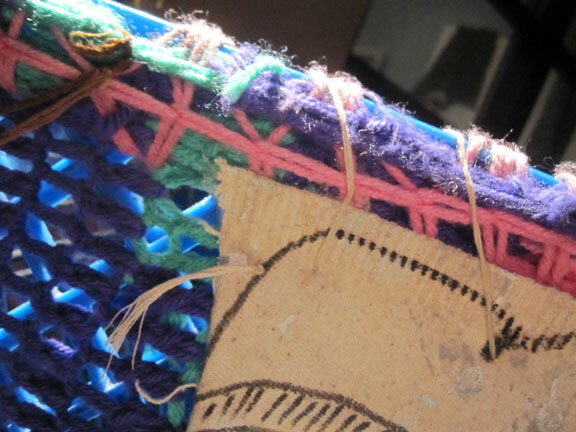 it shows its street colors proudly, the stitches are slightly stringy at the edges, and it has a patina of slight wear and tear, o.k. the yarn has a slightly grimy feel – from being exposed to the elements. but it doesn’t look – like for that long. like they say in the antiquities biz – dude, that’s how you know – it’s the real deal. 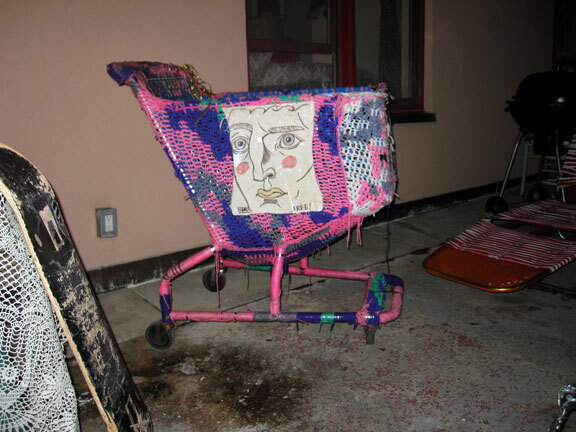 I think its fair to consider the “UR ART HERE” patterned into the crochet – on the front of the cart – a bonafide OLEK signature. and nope, HESH doesn’t come with the cart – but if ur nice – we can get him to deliver it !! the BEAU street tag canvas is attached to the cart – with large stringed loops. It is obviously signed: “BEAU” and you also get: “FREE!” – !! it looks to be a fairly recent attachment – in fact, it looks brand new. two, TWO NYC street tags – for the price of one. now, that’s what we call a NYC – COMBO !! here’s a close-up on the loops of string that attach the BEAU FREE! canvas to the OLEK shopping cart. the BEAU FREE! – part of the equation, how it got there – is still unknown . . . but will most likely unravel – in time. so you get to own a real-time art world narrative – make that: mystery – as well. call in the – street art history detectives. YOU can find our online gallery archives on our: “IF I HAD $200” page. YES, we will consider any serious offers. we are in it – for the a-c-t-i-o-n !! PHOTOS: NANCY SMITH, NYC SEPT 2011.